I have just posted the most amazing pizza recipe Smokey Pulled Pork Pizza with Garlic and Parsley Butter Drizzle. This was my contribution to Lurpaks #GameOnCooks campaign and I thought seeing as I was making such a great savoury recipe I had to balance it out with a gorgeous sweet recipe. I love strawberries and I also love cream but wanted to play about with using strawberries in the cake and bake them. The result was a truly beautiful combination of flavours that will make any foodies mouth water. 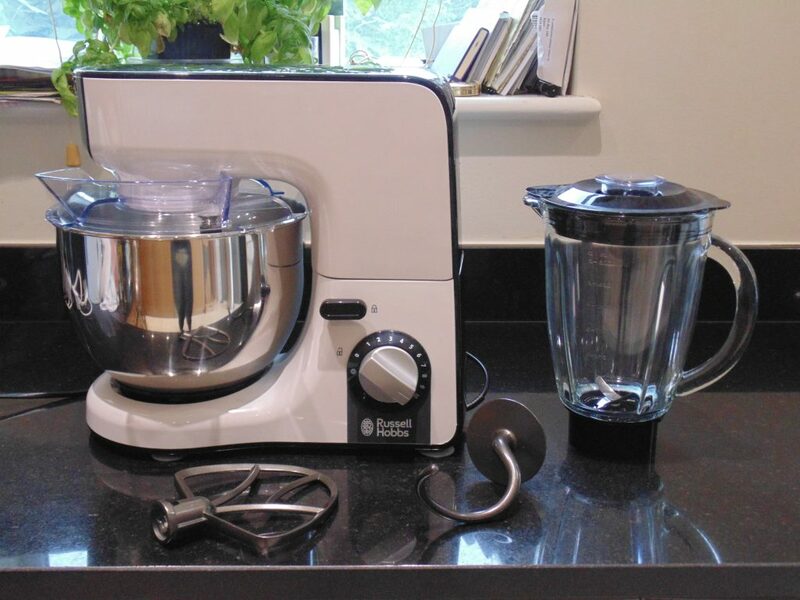 I am super excited as this was the first time I got to use my shiny new Russell Hobbs mixer. How good does my new baby look! Place the sugar, eggs and vanilla essence (2tsp) in a bowl and mix. While that is mixing line a 9 inch loose bottom baking tin and also cover with a thin film of butter. 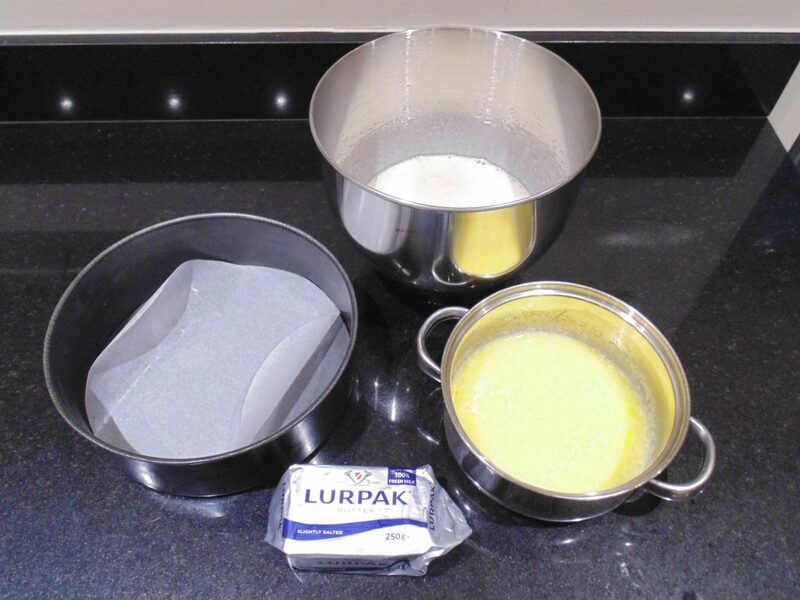 Place the butter and milk in a pan and gently heat until the butter melts then remove from the heat. 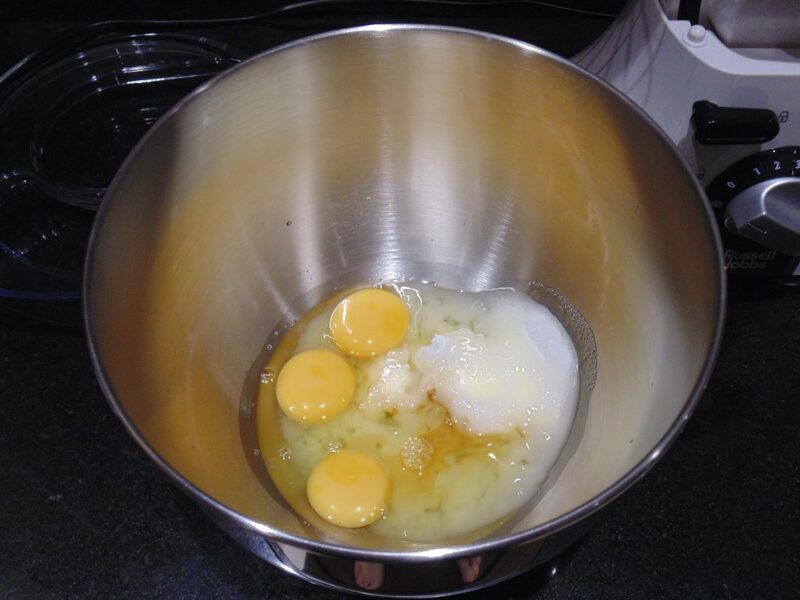 Once the egg mix has been suitably mixed, it takes about 4-5 mins and you will see the mixture colour lightens as air is whisked into it add in the milk mix and stir well. Combine the flour and baking powder then sift into the bowl. Add in the strawberries and gently fold in as we want to keep as much air in the cake mix as possible. Pour the mix into the cake tin and place in the oven. Cook for 10 minutes at 200 degrees. Then lower the oven to 180 degrees cover the cake with foil and cook for a further 30 to 35 minutes depending on your oven. Check with a metal skewer to see if the cake is cooked through before removing from the oven. Just so you are aware the strawberries will sink to the bottom. It’s up to you which way around you want the cake for serving but now is the time to decide. It can look pretty with patches of red showing through at the top of the cake but I prefer the look of the top of the cake without the strawberries as they are an unexpected surprise for those eating the cake. Allow the cake to cool then cut it in half horizontally. (Don’t forget to remove the grease proof paper.) Place one side of the cake cut side facing up onto a serving plate. Place the jam in a pan and heat gently until it breaks up and becomes runny. Remove from the heat and spoon onto one side of the cake. Once the jam has cooled whisk the cream with the 1tsp of vanilla essence then add to the cake. 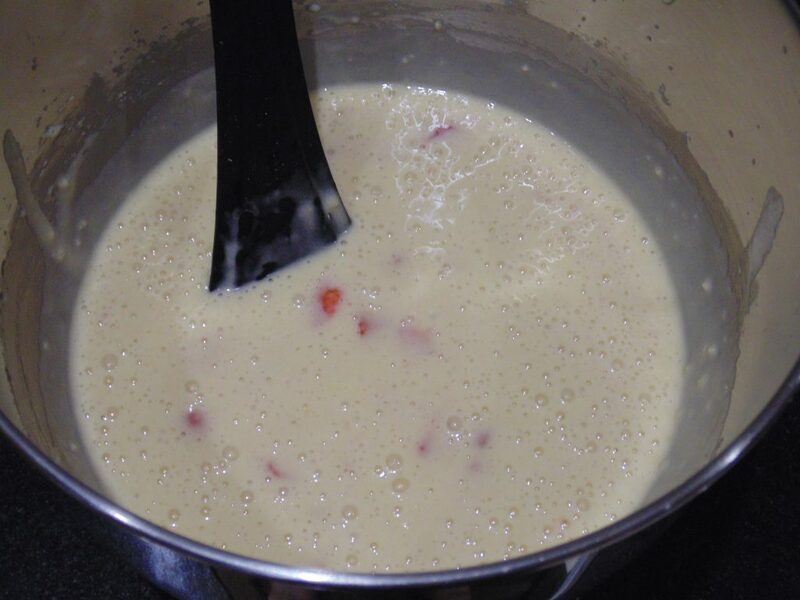 (Make sure you don’t over whisk – cream looses it’s gloss and it’s texture thickens and isn’t fluffy). I like to add a dusting of icing sugar as it makes the cake look pretty. You can’t go wrong with a classic cake like this. Strawberries and cream just go so well together. I love cake with fresh fruit in it, this recipe is so yummy and super easy so I’ll definitely be making this!! Love the look of that cake…and the mixer! Like that it has a lid for the mixing bowl, that’s what I’m after right now as my old mixer just sprays stuff everywhere…will check it out a bit more! This looks amazing!! There goes my diet again!!! I want that mixer! Seriously been ogling stand mixers for so long now. This recipe sounds great and the finished product looks delicious! Wow, this looks delicious. Definitely bookmarking for future use. This sounds like such a treat! I think it would be a really impressive cake to make for guests. Guess this is when we’re glad the fruit sinks – looks so much better! Okay, YUM! That looks utterly scrumptious, what a sweet treat. Yum! I’ve never put milk in vanilla or unflavoured cakes, I should give it a try. Wow really. Give it a try I do most of the time. The cake looks super delicious with all my favorite flavours. They do work well together. This cream cake looks divine. I bet it tasted amazing. cakes looks yummy, wish I could reach in and take a bite! It is fun to have a new toy like that, enjoy it! You can’t beat a classic can you? Yummy! I love cake haha! OOh I do love a good cake and a Victoria Sponge is always the one I opt for, so I like the look of this! Have fun baking, this is a really simple and delicious recipe. This looks sooo yummy. I bet mine wouldn’t turn out like that but I might have to have a go anyway!!! It works well wit black cherry jam I tried that the other day. Looks gorgeous. I will be trying this at home. Yum. I love strawberries and cream, and this cake looks absolutely delicious! Looks lovely, I’ve never baked strawberries in a cake before. It seems to sweeten them and it tastes lovely with the vanilla sponge and cream. It tastes amazing, a must try!!! Strawberry Jam and vanilla are two of my fave flavours so this is a total winner. It is a yummy cake, I’ve made it a few times now. 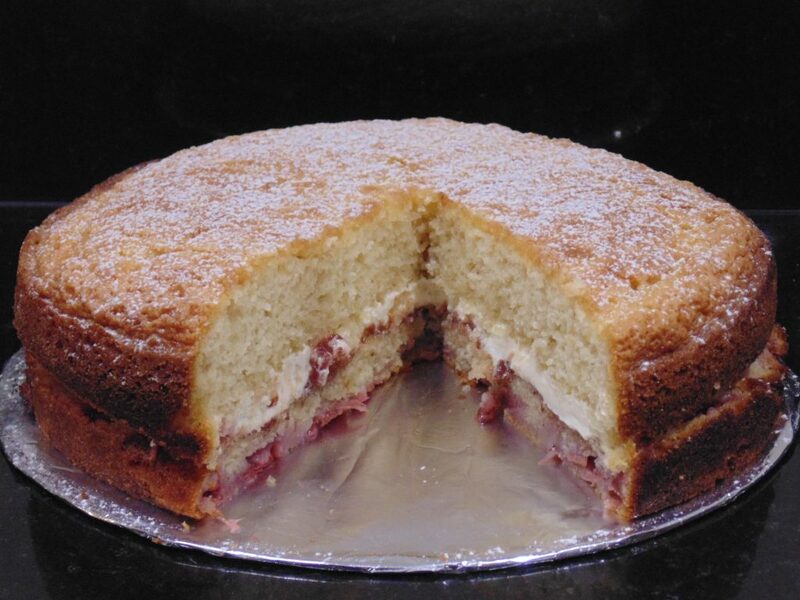 I love making victoria sandwich cakes but never tried it with mixing strawberries in the cake mixture. It looks delicious! It’s a nice twist and baked strawberries are a little different but taste great like this. I want, I want this classic cake looks divine. I love this recipe. I like the layers of strawberries in there and would serve as you have shown here. 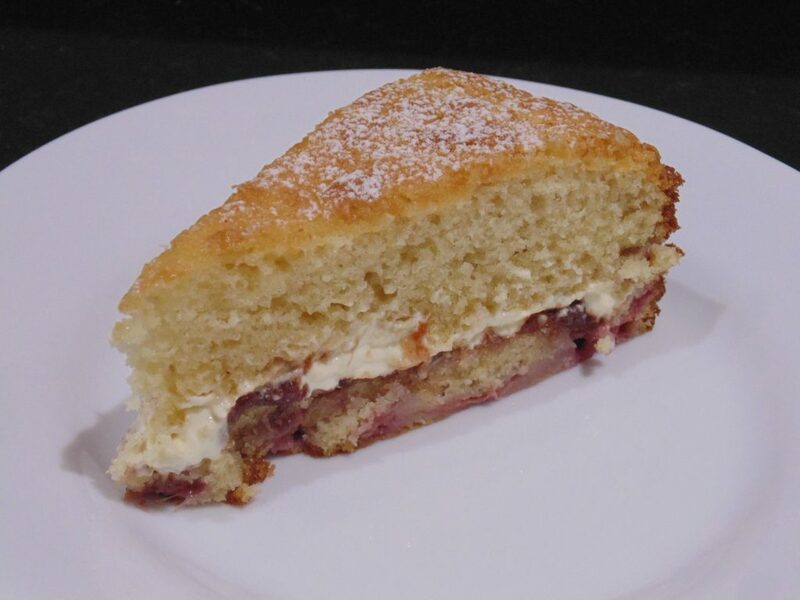 looks amazing; I love a light sponge with jam (any type) and a bit of cream. Recently I have used mascarpone cheese icing instead of butter icing; worked out great for cupcakes. This looks lovely and it is tempting me to make it, although not very good at baking. This sounds tasty. I’m rather limited in what I can bake as I have to rely on the old elbow grease since my ancient hand mixer finally died. I’m envious of anyone who has one of those stand mixers. I keep hinting how nice they are, but so far no one has taken the hint. Maybe this Christmas! That’s a great recipe, looks wonderful. Must have tasted lovely. I absolutely love cake and this not only looks super scrumptious but also looks relatively easy for a novice baker like me to make!